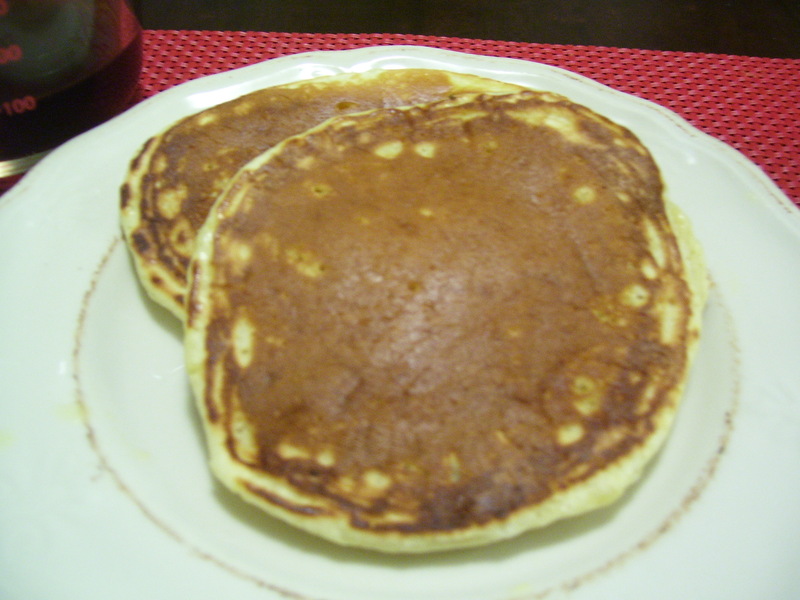 Yesterday afternoon, I got a craving for pancakes. Since last night was leftover night, I decided to give in and make them. Why not? Lauren loves pancakes, I love pancakes and the man of the house, who doesn’t love pancakes, wasn’t going to be home for dinner. Perfect! I have never made them from scratch before. I’ve always depended on mixes. But after making these, I don’t think I’ll ever buy a box of pancake mix again. It took maybe 3 minutes longer, tasted infinitely better and uses pantry items I almost always have. They were light and super fluffy – except for the first two. They fell victim to the first pancake curse and were flat, misshapen and just not quite right. But, the others? They were perfect. I found the recipe here and the only change I made was to add vanilla. But now that I know they were good? I’m excited to play around with it and make all sorts of variations. I think the first will be adding some lemon zest and blueberries. Nom! In a medium mixing bowl, sift together flour, baking powder, sugar and salt. Add milk, egg, vanilla and melted butter. Heat a nonstick skillet (or warm a griddle if you have one) up over medium heat. I sprayed mine with cooking spray. However, I think this is why my first pancakes never turn out. Using a 1/3 c measuring cup, add batter to pan and cook. I used a 10″ skillet and could cook two pancakes at a time. Also, feel free to make whatever size you want, I used a 1/3 c and got 8 pancakes from it. When the edges start to look dry, flip ’em over. Cook a minute or so on the other side. This entry was posted on Friday, April 22nd, 2011 at 12:01 am	and posted in Recipes, Toddler Favorites. You can follow any responses to this entry through the RSS 2.0 feed.